Orko gets a bit of a bum wrap; 'the Jar-Jar Binks of Eternia', 'the cringe factor that lived with Cringer', but me, I dug the little dude. Every time I watch the live-action Masters of The Universe movie (which is a lot), I still think of what would've been if obvious Orko replacement Gwildor was actually the pink shirted magician. Long story short, seeing this hoodie made me want one. For Halloween and not so Halloween based occasions (weddings, baby showers, etc). You can take the hat off, and still have big blue ears!! It's truely is the gift that keeps on giving, available exclusively at 80stees.com. Now if they could just find a way to hide your legs when you wore it. I just woke up Karl, and while I wrote today's post I couldn't help but see the stats on this one. It's got some pretty high viewership numbers from the facebook link for just being a view hours old! 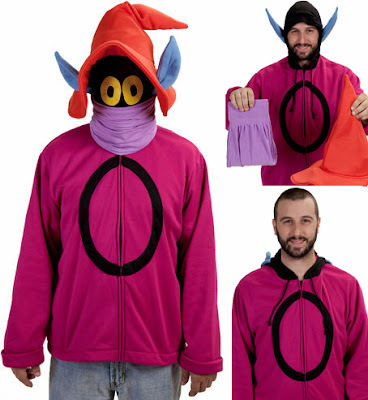 Look out for a horde of Orko's this Halloween buddy! I never did understand why they replaced Orko with Gwildor. Orko had a following. Orko had a history. And Orko had the sense to cover up whatever hideous face he had with a scarf and a big hat. I'd wear this. Of course, I'd also wear a my little pony costume. I'd wear it too Random, and when folks who didn't know asked what the 'o' stood for, I'd say 'Oarsome' - spelling never was my strongest point.